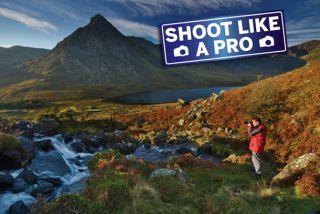 In this popular tutorial from our Shoot Like A Pro series we took an in-depth look at photography lighting and how you can take control of the elements to get more balanced, beautiful pictures. We start by taking a closer look at the character of light and how the quality of light will affect your images. Light is more than just how bright or dark it is; it's also the key to the look, mood and atmosphere of your images. The direction of the light will affect how the shape and texture of your subject appears, while the colour and how soft or harsh the light is can totally change a shot's appearance. Light's very important, so in this series we'll show how a few simple camera tricks and techniques can guarantee better images - from choosing the right time to visit a photo location to taking complete control of the light by using flash. There are three basic characteristics of light that determine how your shot will look: how harsh or soft it is, the direction and the colour. It's easiest to tell the quality of the light by looking at the shadows, rather than the areas in the light. Harsh, direct light creates strong, well-defined shadows, while the shadows created by more diffuse lighting are much softer. The location of the shadows tells you where the light is coming from, as they appear on the opposite side to the light. How hard or soft the light appears is due to the apparent size of the light source from the subject's position. A small light source produces hard, directional light, while a very large light source produces much softer light. Remember it isn't the actual size of the light that matters; it's how it appears to the subject that you are shooting. For example, the sun is huge, but because it is so far from the subject it acts like a tiny light source. The direction of a light source, and the shadows it creates, will affect how the texture and form of the subject will appear. Light from the camera position (or behind it) will produce flat light on the subject, and also create shadows directly behind the subject. This is good for capturing fine detail, but won't reveal much of the texture or shape in the subject. You'll get much more interesting results when the light is coming from one side of the subject. This effect, known as side lighting, produces shadows on the opposite side to the position of the light, revealing texture and contours in the subject. A common photography lighting situation you'll encounter shooting outside during the middle of the day is when the light is falling from above the subject. This can create unflattering results, especially when shooting portraits, as the eyes will be dark, and there will be shadows under the nose and chin. Along with the quality and direction of the light, the colour of different light sources can have an effect on the appearance and mood of your images. This variation in light is known as the colour temperature, and it's why your camera has a white balance setting to correct the colours from these different coloured light sources. The colour temperature of light is measured using the Kelvin scale. The lower the colour temperature, the more red the light will be, while the higher it is the more blue. Normally you'd set a white balance to get neutral coloured results, either by using the automatic setting, or a preset white balance such as Tungsten, Sunny or Cloudy. But by setting the 'wrong' white balance you can also use these presets to give warmer or cooler results. With a few props you can experiment with lighting set-ups. Move a lamp into different positions and note the effect that this has on your subject, and the shadows. You'll need a high ISO such as 800 or 1600 to get a fast shutter speed and avoid shake. See our disc for more DIY lighting tips! With the light behind the camera, and pointing directly at the subject, you'll get very flat lighting. This is the same as you'll get by shooting with the sun behind you or using an on-camera flash. Moving the light to one side of the subject produces a far more interesting light, as it shows the shape of the subject much more than when the light is coming from the camera position. With the light behind the subject you get a completely different effect. This time most of the light is hitting the side of the subject, which creates a more atmospheric and moody image. In this section we take a look at some of the easy ways you can improve the light available to you. Controlling the light for large subjects such as landscapes is impossible, but for smaller subjects such as portraits, close-ups or details in the landscape you don't always have to make do with the lighting conditions exactly as they are. There are plenty of different ways that you can alter the light, especially when you find yourself having to shoot in harsh, direct lighting conditions. As we have already explained, to get softer light you need to make the light source appear larger to the subject. Moving the light closer to the subject will help to produce softer light, but this isn't always convenient, or even possible. If you are shooting a small subject in sunlight, then you need to use a diffuser between the light and the subject, to make the light source appear much larger. This doesn't have to be an expensive piece of kit, it can simply be a piece of semi-transparent white paper or cloth, or you could go for one of the folding diffusers such as those from Lastolite.